“Our County has been committed to sustainability in our operations for a long time. And we noticed early on that our purchasing dollars also have an impact in our local economy and in the world. We wanted to make sure that was a sustainable impact,” explains Church. Alameda County purchases $350 million in goods and services each year, and through their Sustainable Purchasing Program they prioritize purchases of environmentally friendly products and contracts with vendors who have sustainable and green business practices. What does this look like in everyday application? Sustainable purchasing takes many forms and is constantly evolving in step with technology and innovation. Today, Alameda County’s Sustainable Purchasing Program makes a point of purchasing products with environmental specifications — from office products and janitorial supplies to furniture and fleet vehicles. In fact, a third of Alameda County’s fleet is now comprised of electric and hybrid vehicles, a move which hits three sustainability goals the county cares about: moving away from fossil fuel reliance, reducing air pollution, and minimizing climate impact. “This progress is made possible through an ongoing collaboration between Alameda County’s Office of Sustainability, the Transportation Division, and the Procurement Department.” explains Cook, Sustainability Project Manager for the county. But Alameda County has gone one step further in their collaboration efforts. After twenty years of expanding their green purchasing and establishing a model for sustainability at the local level, the county realized that to move the needle even further they needed to bring other public purchasers into the mix. Alameda County recognized they were only one of many public entities in the region making decisions about sustainability every day — but as one of the largest, they could help pave the way and model best practices. So in 2013, Cook initiated a partnership between Alameda County Sustainability, key internal partners, and local public agency StopWaste to develop a regional green purchasing roundtable. Today, the Roundtable has grown into a forum where cities, school districts, special districts, and other public agencies in Alameda County come together to learn from experts and each other about how to make greener purchases, get buy-in from users, and implement successful green contracts. It is one of the only public-sector convenings in the nation to focus specifically on sustainable purchasing. By working together and sharing best practices, the Roundtable helps encourage sustainable purchasing throughout Alameda County. The Green Purchasing Roundtable also has the important ripple effect of boosting the local green economy. One of the biggest bolsters to the green economy is through consistent, large scale purchasing and support of local businesses that are bringing sustainable products to market. In their purchasing, Alameda County and other public agencies in the Roundtable provide active opportunities for small, local and emerging businesses. “Circulating our money within the [local] economy, being inclusive of our small and local businesses in our contracting opportunities, and encouraging them to be as sustainable as possible… that enhances our community. [Local businesses] are better able to compete and those dollars continue to circulate here in Alameda County,” explains Linda Moore, Business Outreach Officer for Alameda County’s Office of Acquisition Policy. By leveraging the power of their purchasing dollars and building a collaborative process with other public agencies throughout the region, Alameda County is delivering on the mission set out by their Board of Supervisors. “Not everyone thinks about the impact of purchasing, but it’s an incredible lever for change in our local economy, in our local community, and around the world.” emphasizes Church, with a smile. To learn more about Alameda County’s Green Purchasing Roundtable and sustainable purchasing initiatives, visit acsustain.org. 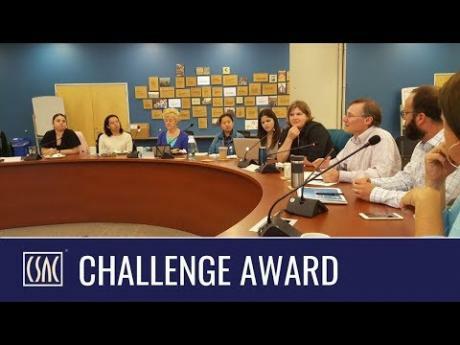 This Alameda County program is a recipient of a 2018 CSAC Challenge Award, which spotlights the most innovative programs in county government.